The Iraqi Security Forces (ISF) reached the Tigris River on January 8 after recapturing several of the remaining neighborhoods in southeast Mosul. 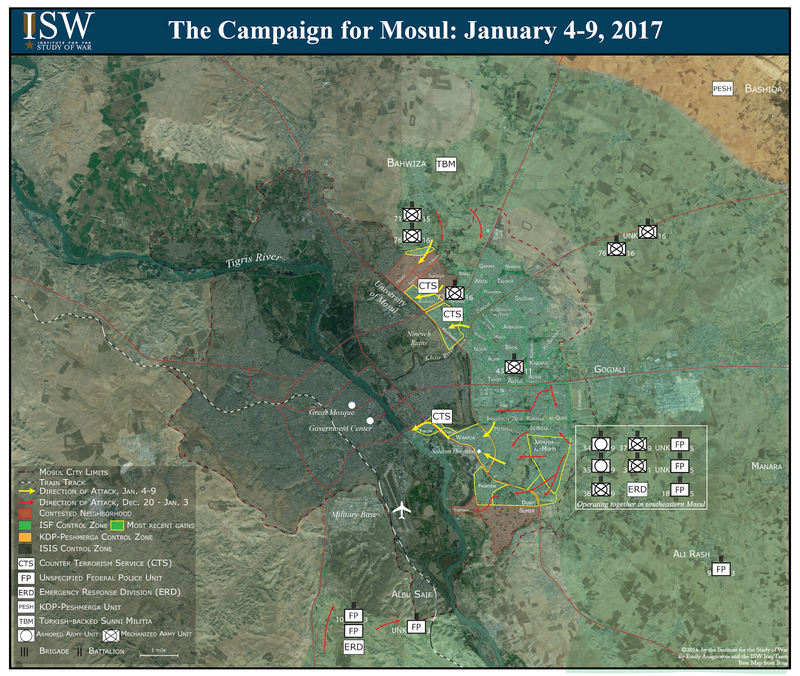 In the north, the ISF pushed into central Mosul from the north and east from January 4 to 9, nearing the University of Mosul. 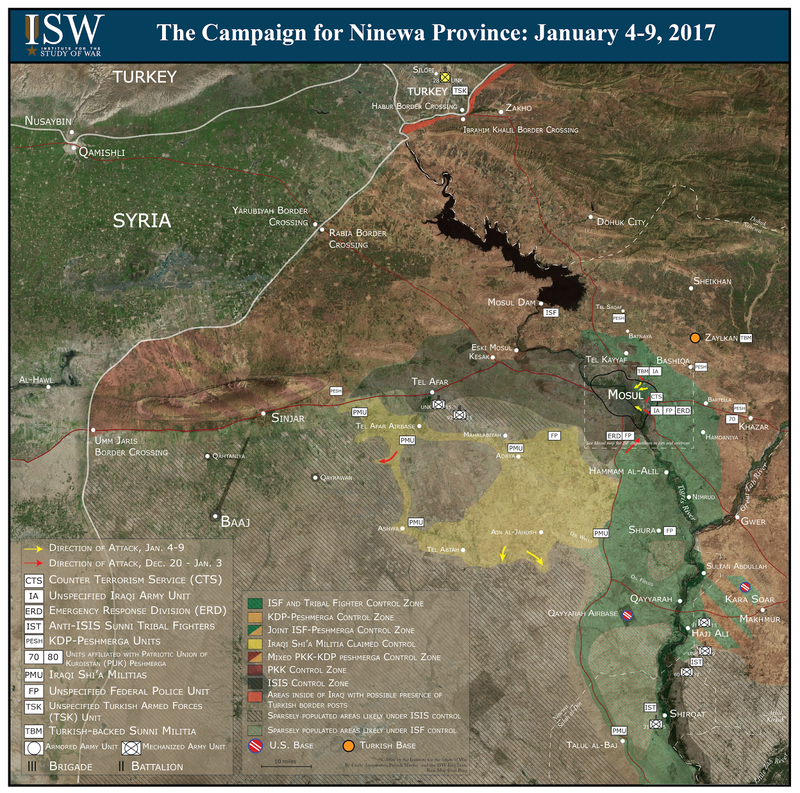 The ISF pushed towards key infrastructure for ISIS in Mosul after making significant progress in the northern and southeastern neighborhoods from January 4 to 9. The rapid gains follow new accelerants added to the operation from December 29 to January 3, with the arrival of ISF reinforcements and increased Coalition trainers. Newly deployed Federal Police units, working alongside the existing Iraqi Army units, are consolidating control of southeastern Mosul. Meanwhile, the Counter Terrorism Service (CTS) reached the Tigris River after securing the eastern bank around the southernmost Fourth Bridge on January 8. The CTS, however, is unlikely to make any advance by ground into western Mosul in the near term because the bridge is inoperable due to previous Coalition airstrikes that destroyed the bridge in an effort to prevent ISIS movement into eastern Mosul. Coalition advisors on the ground will likely assist the ISF in rebuilding the bridge, or creating a new one, as they did in Qayyarah in July 2016. The ISF will likely pause before an operation launches to cross the river in order to regroup and plan for the likely stiff ISIS resistance on the western bank. It may also coordinate an advance into western Mosul with units remaining south of the city in order to retake the airport and military base. The CTS is also leading a push from the north towards the University of Mosul, which had previously been a major logistical hub for ISIS in the city. The CTS entered the area after crossing the Khosr River, a tributary that feeds in the Tigris, during a night raid on January 6, shifting the focus from northeast to northern Mosul. Their effort was matched by units from the Iraqi Army breaching Mosul’s northern limits for the first time on January 6 as well. Their entrance into the city limits is likely the result of U.S. advisors embedding deeper in the ISF’s ranks, as the army units had struggled to advance beyond Mosul’s northern suburbs for weeks. The ISF will likely face significant resistance as it enters the university, though it is unclear if ISIS will actively fight for the campus. A CTS official reported on January 8 that ISIS had burned several buildings before withdrawing, corroborating earlier reports. ISIS may decide to heavily mine the buildings and crater the roads instead of fighting in order to slow the ISF’s advance and leave it vulnerable to counterattacks but limit the risk of its own casualties.